The launch took place on Wednesday, December 19 at 1:37 p.m. (local time) from the Guiana Space Center (CSG), Europe’s Spaceport in French Guiana (South America). 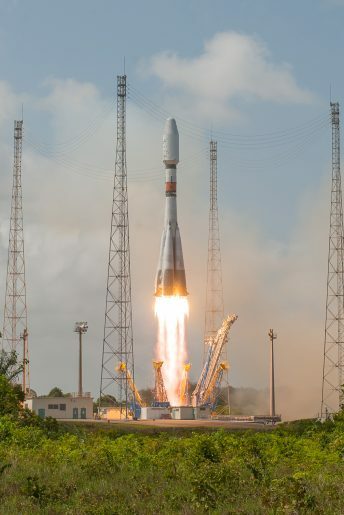 With this latest launch in support of France’s defense requirements, as well as for the capability needs of several partner countries, Arianespace once again guarantees French and European independent access to space — which is a strategic priority and a key element for sovereignty. Since its creation in 1980, Arianespace has orbited a total of 591 satellites, including 69 for defense and security purposes. CSO-1 is the 42nd satellite orbited by Arianespace for CNES and the DGA. Its predecessors include the Syracuse family of military telecommunication satellites and the Pleiades very-high-resolution space imaging system. CSO-1 is the first satellite of the Optical Space Component (CSO – Composante Spatiale Optique) program, comprising a constellation of three new-generation satellites for the French Ministry of Defense. They will carry out two different missions: reconnaissance for CSO-1 and CSO-3, and identification for CSO-2. As the successor to the Helios 1 and 2 systems, CSO will address France and Europe’s operational needs for global intelligence and strategic surveillance, knowledge of the geographic environment, and support for operational deployments. Airbus Defence and Space France is prime contractor for the satellites, while Thales Alenia Space France is supplying the optical imaging instrument. To date, Arianespace’s backlog includes six more missions for CNES and the DGA: CSO-2 and CSO-3; Syracuse 4A and 4B; three CERES satellites, and the Taranis satellite. After the Helios 1 and 2 satellites (the first and second generation of military observation satellites), the third-generation CSO spacecraft will be accessible to European partners through bilateral agreements with France as part of the MUSIS program. Germany, Sweden and Belgium already have joined the CSO user community, and an agreement with Italy will be signed shortly. Spain: XTAR telecommunication system and Spainsat satellites. James Webb Space Telescope (JWST) for ESA in collaboration with NASA, using Ariane 5. Arianespace also has a very successful export track record in providing launch services for defense and security applications. Japan, Peru, Chile, Brazil, Morocco, Turkey, Thailand, Egypt and the United Arab Emirates have chosen the company to orbit satellites that safeguard sovereignty. Drawing on the reliability and availability of its current launchers, along with the upcoming generation of Ariane 6 and Vega C launch vehicles, Arianespace guarantees independent access to space for all customers, especially European institutions. The CSO-1 satellite was built by Airbus Defence and Space.